They are being assisted by a lady from the store. As a volunteer researcher for the BBC "People's War" project between 2004 and 2006 one of the most best aspects of it was the opportunity to work alongside some of the BBC reporters and other staff in helping those with wartime memories to record their story for posterity. One of the most memorable events during 2005 was the weekend of the Whitehaven Maritime Festival (24 - 26 June 2005) which incorporated the official WW2 60th Anniversary Victory Commemorations and a Parade of WW2 Veterans. Among the BBC staff organising the "People's War" tent and volunteers at the Whitehaven Maritime Festival were Jemma Bellingham, Helen Skelton and Joan Armstrong. The above photograph shows Jemma and Helen in front of the "People's War" desk at this event. With more than 1000 WW2 veterans and many people present with memories of the 'Home Front' during WW2 the BBC "People's War" tent had a large number of visitors during the weekend of the 2005 Maritime Festival, many of them telling their stories for the project. Joan Armstrong has went on to interview many people in their own communities for the BBC Radio Cumbria Bus and has also produced a number of radio programmes for the local radio station. Jemma Bellingham is a well-known and successful rally competitor and has since moved on to work for BBC Radio Lincoln. Helen Skelton co-presented the BBC Radio Cumbria Breakfast time programme for over a year, before moving to London. In 2008 Helen became one of the presenters of the BBC TV Children's programme "Blue Peter. 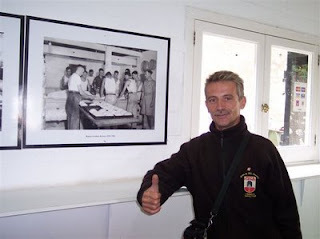 Mr Hans J. Cön, one of the excellent guides to Gibraltar’s WW2 Tunnel Tour. 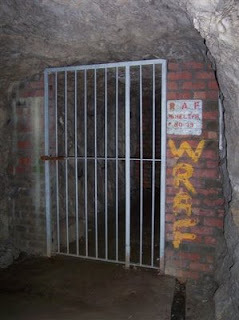 The guided tours of Gibraltar’s WWII Tunnels, opened to the public for the first time in 2005, allow people to walk in the footsteps of many of the great leaders of the war years who visited the Rock Fortress – including British Prime Minister Winston Churchill, Free French leader General de Gaulle, Poland’s General Sikorski, and the Allied Supreme Commander General Eisenhower. Gibraltar was however one place during the war years at least that no German soldier, sailor or airman ever visited. However, one of the excellent tour guides who bring the interesting history of the tunnels to life is Hans (seen in the photograph above) a German who said he was “… the last German POW of the war!” Hans, and his fellow tour guide Richard Desoiza (a Gibraltarian), also do the narration for the official Gibraltar WWII Tunnels DVD. This explains about the history of the Fortress from the 1700s onwards and is certainly excellent value for money for anyone with an interest in WWII or indeed Gibraltar. There are many original photographs from WWII that can be seen during the tour. The one seen in the above photograph with Hans shows the cooks baking inside the Rock using electric-powered ovens. Electricity was used for ovens inside the Rock rather than oil, wood or solid fuel to minimise fumes inside the tunnel. During WWII the Women’s wartime accommodation inside the Rock of Gibraltar was designated Tunnel F 13. This was the only accommodation tunnel with a locked gate at the entrance. With the concern about a possible assault by the Axis Forces in 1940 additional tunnels were excavated inside the Rock of Gibraltar. These were planned so that about 17,500 Allied troops would be fully sufficient and be able to withstand a siege for at least two years. To assist such a force to hold out against a siege, some of the new excavations were made over to catering, a hospital and accommodation. Although there never was an assault or a siege on the Rock of Gibraltar during WWII, about 5000 men and 300 women had their billets inside the Rock. The women of the WRAF were accommodated in Block F 13, the number being allocated as it would be unlucky for a man to enter there! With such a big gender imbalance for a long period inside the Rock, the WRAF accommodation quarters, unlike the ones for the men, were behind a locked gate, as can be seen in the above photograph. The women had a key to enter and leave their accommodation, and it is believed that no man ever crossed the threshold! In 1940, most civilians not employed for the military requirements of Gibraltar were evacuated from the Rock. Some of them did not return to their homeland until some years after the war. However, the evacuation did have major consequences for those who regarded the Rock as their home. 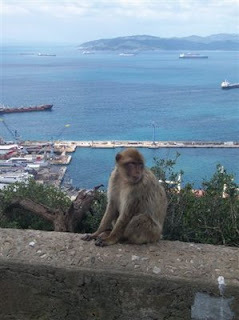 Upon their return they were no longer just people living in Gibraltar. They were now a united people with a common identity – Gibraltarians.